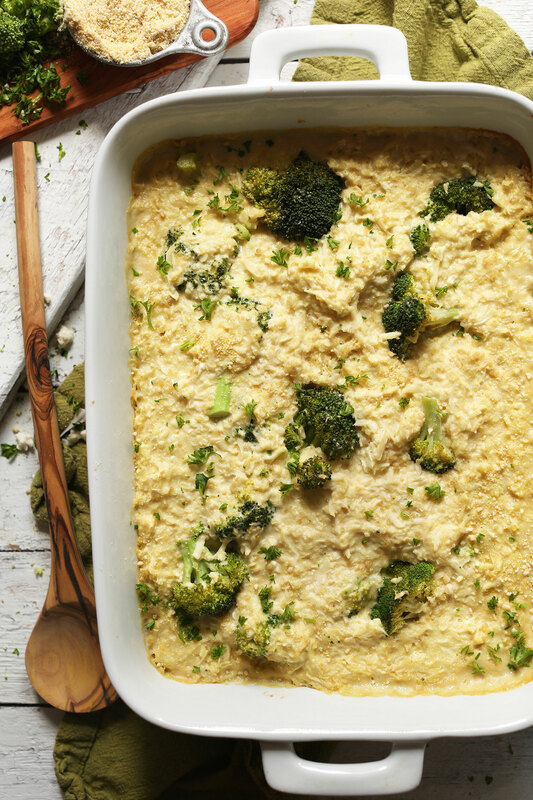 Consider this my healthier, vegan homage to a cheesy broccoli rice casserole. However, I don’t like the words “casserole” or “hot dish.” Hearing them conjures up images of church basements and mystery potlucks. So, instead, why don’t we call this a bake? Glad you’re on board. This recipe screams fall and the holidays. Am I jumping the gun on fall-themed dishes? I say no. 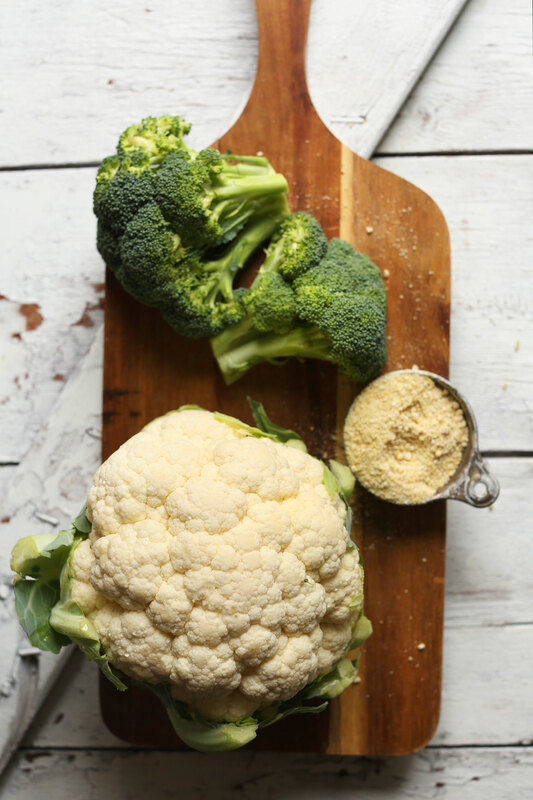 Cauliflower and broccoli are in my part of the world at the moment and I’m putting them to good use recreating one of my favorite side dishes. 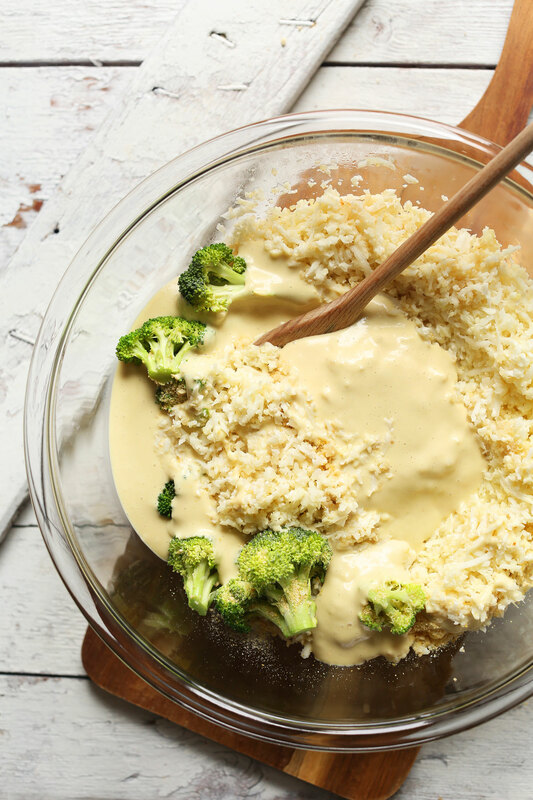 Anything with broccoli covered in “cheese” (in this case, vegan parmesan – aka gold dust and my go-to mac ‘n’ cheese sauce) is a winner in my book. This recipe is easy to make, requiring just 10 ingredients and simple methods. Plus, it comes together in just a little more than an hour. The base is lightly sautéed cauliflower rice and steamed broccoli tossed in vegan parmesan cheese and my super velvety mac ‘n’ cheese sauce. Then it’s poured into a baking dish, topped with more vegan parm, and baked! A short 30-45 minutes later you have a bubbly, golden brown masterpiece on your hands. This is the perfect side for weeknight meals or to bring along to holiday gatherings. People won’t believe this is dairy- and gluten-free. Bonus tip! To make this dish entrée-worthy, add in 1 cup cooked chickpeas for even more fiber and protein. If you try this dish, let us know! 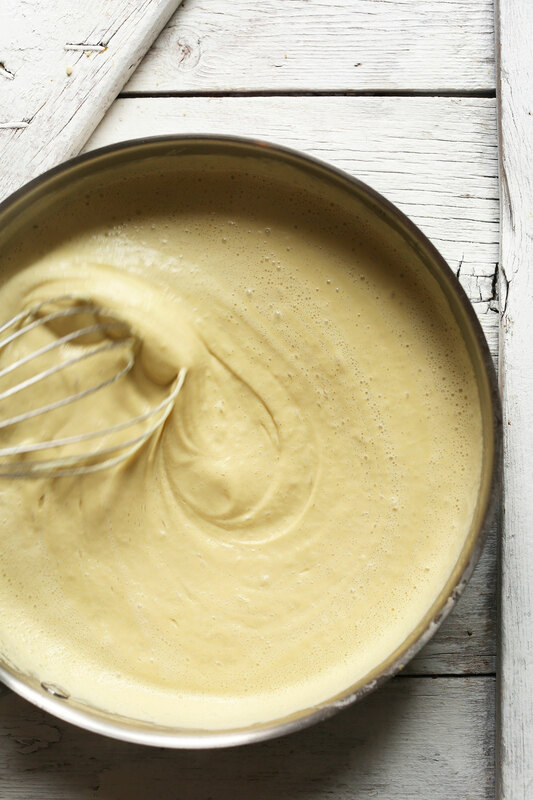 Leave a comment, rate it, and don’t forget to tag a photo #minimalistbaker on Instagram. We’d love to see what you come up with. Cheers, friends! 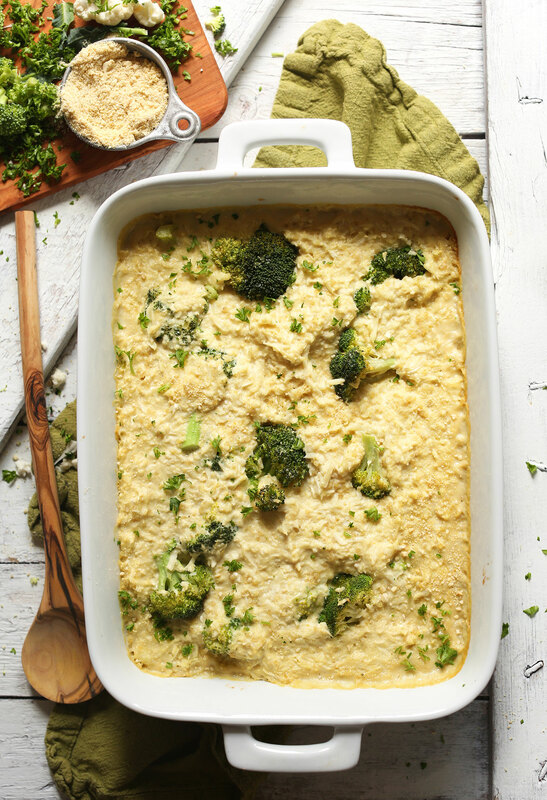 Savory, cheesy cauliflower rice and broccoli bake with just 10 ingredients required! The perfect healthy, comforting side dish for holidays and every day! Preheat oven to 375 degrees F (190 C) and lightly grease a 9x13 inch (or similar size) baking dish (adjust number/size of pan if altering batch size). Prepare your cauliflower rice (either with the shredding attachment on your food processor or a box grater). Set aside. Lightly steam your broccoli - just until it has a slight bite - either in the microwave in 45-second increments or on the stovetop using a steamer basket in a saucepan with 1-2 inch of water). Place in refrigerator for later. Next prepare your sauce. Heat a large, oven-safe skillet over medium heat. Once hot, add oil and minced garlic. Stir and cook for 1-2 minutes, or until light golden brown, then add arrowroot starch and whisk - cook for 1 minute. Slowly add almond milk while whisking, then cook for 2 minutes over medium heat, stirring frequently. The sauce will likely look a little clumpy - that’s OK! We’re going to blend it. Transfer mixture to a blender, along with 1/4 tsp each salt and pepper (amount as original recipe is written // adjust if altering batch size), nutritional yeast, and vegan parmesan cheese and blend on high until creamy and smooth, scraping down sides as needed. Taste and adjust seasonings as needed - you want it pretty well salted + cheesy, so don't be shy with the nutritional yeast, salt, and vegan parmesan cheese. Return sauce back to skillet from earlier and cook over low heat until warmed and slightly thickened - about 2-3 minutes - whisking occasionally. As it warms back up, it will thicken (see photo). For a thicker sauce, leave it as is. To thin slightly, add almond milk 1 Tbsp at a time until desired consistency is achieved. Turn off heat if it starts bubbling too aggressively or gets too thick. Heat a separate skillet over medium heat. Once hot, add 1 Tbsp oil (amount as original recipe is written // adjust if altering batch size) and cauliflower rice. Season with salt and pepper and stir to coat. Then cover and let cook/steam for 2 minutes. Remove cover, stir and cook for 1-2 minutes more or until slightly softened. Transfer to a large mixing bowl. Add the steamed broccoli to the mixing bowl and season liberally with salt, pepper and half of the vegan parmesan cheese (1/4 cup as original recipe is written // adjust if altering batch size). This step is important to infuse plenty of flavor into the dish. Stir to coat. If adding chickpeas or kale, add at this time (optional). Add all of the sauce to the mixture and stir to coat. Then transfer to your greased baking dish and top with another sprinkle of vegan parmesan cheese. Cover with foil and bake at 375 degrees F (190 C) for 20 minutes. Then remove foil and bake at 400 degrees F (190 C) for 5-15 minutes more or until bubbly and slightly golden brown. You are looking for golden brown edges and a bubbly center. Remove from oven and let cool slightly. Then serve as is or with a garnish of more vegan parmesan cheese and/or fresh chopped parsley for some color - optional. Best when fresh. Store leftovers covered in the refrigerator up to 4 days, or in the freezer up to 1 month. Reheat in the oven at 350 degrees F (176 C) until warmed through. This looks amazing and I want to have it as a main so would certainly need some protein. I just thought instead of chickpeas or quinoa how would green lentils or black beans be? What would you think of the taste as a cook? Thank you! This is cooking right now and I’m already giving it 5 stars – because I licked the spoon…ok I ate a few spoonfuls while putting in the dish to bake. I added kale and quinoa and chickpeas on top…hoping they crunch up in the oven. Looking for ideas of what to serve if I use this as a side dish. Thanks for another amazing dish! We hope you enjoy the finished product, Michelle! I was very intrigued as to how this dish was going to taste so decided to give a try after reading all the positive remarks. Turns out, it tasted delicious. Love how it tastes and feels so comforting yet at the same time you don’t feel uncomfortably full after eating it. Will definitely be making this again. We are so glad you enjoyed this dish, Dominique! Thanks for the review! Thank you so much for this great Information. Keep up the fine work! This was so good!!! The sauce is incredible, I had to stop myself from eating all of it with a spoon. I added the chickpeas and ate it as an entree, and it was really filling and delicious. I use your recipes all of the time. They are so versatile. I made a variation of this tonight and it was incredible and comforting and so filling ! This was so delicious! My non vegan husband loved it too! It reminded us of the cheesy vegetable casserole that his mom used to make, just withought the eggs and dairy. Super yummy! I couldn’t wait to wake up and have the leftovers for breakfast! Thanks! HI! I’m Hope and I have a blog. A friend of mine made this dish and posted it on IG. It looks so tasty and I want to post it to my blog with a link to my friend and a link to your page for others to get the recipe. Will this be ok? I’m over at http://www.honeygrovebears.com and I’d like to put it under my “tasty treats” tab. Hi Hope! You’re welcome to share it as long as you follow our sharing guidelines which you can find here! Made this for a group of non-vegans and every single person loved it… I’m not counting the five year old, right now. So, yes. Every. Single. Person. Lol. Pretty much followed the recipe to a ‘T’. Used flour for lack of arrowroot and more than the recommended 2 cups of broccoli to sate my love of them… uh… lovelies. Thanks for another stellar job. This continues to be my go-to recipe site! This is one of my favorite vegan casserole recipes. It tastes great served with some hot sauce! I would definitely suggest using extra salt/vegan parmesan for additional flavor. Made this for dinner tonight. Turned out pretty good! Next time, maybe I would try blending cashews in the sauce to make it a little richer. Smart! Glad you enjoyed it. I am currently nut free due to health issues. Is this dish worth making without the vegan Parmesan cheese ? I am not comfortable subbing with a processed store bought brand. Hello from across the bridge in Vancouver! Ten stars for this dish. Crazy good. I followed the recipe exactly, also adding about a cup and a half of chopped kale before I baked it. OHHHHHHHHH MAN. So, so good! Loved the extra texture from the kale, too. I served it alongside a Tofurky ham roast tonight, and it reminded me of a comfort meal I would have eaten when I was a kid, minus all the gnarly ingredients and animal suffering. This will for sure be my go-to recipe for potlucks and holidays. Thanks so much for a solid side dish! Such a great recipe! I added about 1/2 cup white wine in place of some milk to be adventurous and it turned out great! Also since I’m not vegan I added about a pound of shredded cooked chicken to make it a main course. Thanks so much! Since you say this is best fresh, could I make everything up to step #12…cover and refrigerate overnight, then bake the next day? If making a day ahead would you suggest leaving it raw and baking on the day or baking the day you make it and reheating it’? This looks good! But can this be made up one day and then baked the following day? I want to make it for Thanksgiving but everything is always so hectic that day. Thank you! Hi Rachelle! Store leftovers covered in the refrigerator up to 4 days, or in the freezer up to 1 month. Reheat in the oven at 350 degrees F (176 C) until warmed through. Hi there, I plan on making this tomorrow and I am wondering if you saute the rice first with oil before putting it together or if the “rice” is uncooked until baked. Thanks! Clearly I didn’t make it down to step 9 before posting my question – just saw set aside and then asked. My apologies! Can I use Tapioca Flour/Starch instead of arrowroot starch? Hi Jill! Yes you can! Yum! This was a great recipe! My little ones all devoured it. If anyone is looking for a kid friendly recipe, this is it! I will be making this regularly. Just made this with a few variations – sautéed an onion, didn’t blend the sauce (I was feeling lazy and din’t want to wash the blender), added some curry, used your chickpea suggestion, and added some chopped kale. Delicious! Thanks for such a great recipe! I made this today to clean out my fridge; OMG, this is comfort food. Next time I will prep earlier. it takes a few minutes to make the sauce and prep the cauliflower and broccoli. It was worth it. I love this one. It was very good. I think that next time I will add fried onion rings on top too. Thanks! I made this for my boyfriend and sister in law which both raved about it. This dish was flavorful, filling and loved all the textures in this meal. Big thanks for this well written recipe!! This was AMAZING. My 2- and 3-year old devoured it. And I added kale! I had to fight my husband for seconds. You never let me down, but this was remarkable. Thank you so much! Hi! Store leftovers covered in the refrigerator up to 4 days, or in the freezer up to 1 month. Reheat in the oven at 350 degrees F (176 C) until warmed through. Amaz-zing! Super easy to follow. Made for my wife and I last night. Added the optional kale and quinoa for a master piece. Will make again! Side dish glory, but ate as entrée. Dana, your recipes have made it easy for us to remain plant based eaters! I heart you! Thank you so so much! Delicious! It is an excellent comfort food for the winter. The family loved it. I used the kale option and also threw in some leftover quinoa after cover-cooking the cauliflower “rice”. The taste makes it worth the time factor, but I might not do this again unless I have someone else washing the dishes or it’s for a special occasion. And I WILL do it for special occasions: it’s definitely one of those impress-your-non-vegan-friends-at-the-potluck kind of dish. I’ve been wanting to make this recipe for a month now. Being in AZ, this is finally the perfect time for some warm belly food. I pretty much followed the recipe. I did use organic flour in place of arrow root (no one in the house has gluten issues). While there are quite a few steps, I saved some time by having the cauliflower and broccoli ready to go right in a head of time. I also used a deeper pan for the sauce so I could use my emersion blender so I didn’t have to go from pan to blender to pan. Both my non-vegan husband and teenager were really surprised how much they liked it. I will definitely make this one again! I have been LIVING off of your recipes for about a year now, and I just wanted to reach out and thank you for being such a life-saver. All your recipes are amazing, and I just ordered one of your cookbooks. Can’t wait to make this one tonight. Thank you, thank you, thank you. This was really yummy! I made it for our Christmas eve dinner and my husband LOVES it. We’ve also been eating the leftovers as a warm dip with ritz crackers and it’s perfect! I do have a question about the vegan parm though- is there a particularly brand you love and used? The vegan parm I used has a slightly “chemical” taste to it so I’d rather switch brands (or make my own) next time! I always make my own! Thank you!! I figured you made your own, I will definitely do that the next time I make this (which I’m sure will be soon!). I made this tonight and really liked it. A few changes- I skipped the arrowroot completely. I was low on milk so I put put about a cup of cashews in the blender with water and added that- made it creamy w/o the additional thickener. I also skipped cooking the cauliflower and just put it in the sauce on the stove. I put the broccoli, yeast, and salt and pepper right in the casserole dish and put the sauce w/cauliflower grated in right over it. I forgot to grease the pan and it came out just fine. Really an excellent recipe. Thanks! I love this dish, and decided to make the gluten-free version of the sauce with arrowroot starch. The starch turned the lovely cheesy sauce into kindergarten paste! I didn’t want it to ruin the dish, so I had to toss it and make a new sauce with flour, as originally posted. Do not use the arrowroot starch! OMG! I made this last night and my husband and I ate the entire dish! I coudn’t find arrowroot so used Bob’s Red Mills Tapioca Powder. I accidentally dumped all of the batch of vegan parm into the creamy mixture, but was fine since I made more for topping! I usually skip the garlic and did here and was still amazing. Since it was our main dish, we pan fried some leftover linguini in a tiny bit of olive oil and mixed it w/ the dish so it ended up like a creamy alfredo pasta sauce. Husband said this was one of the best things I’ve ever made! I’m not able to cook the garlic and flour without the almond milk. I ended up burning the garlic. So I just put the milk and flour together at the same time. It still turned pretty good, even with some burned garlic. I thought I had the sauce the right consistency, but apparently it was too thick. There was also too much garlic for my taste. I’m going to try it again but with less garlic. This is my favorite recipe of the year! I’ve already made it three times and everyone I’ve made it for has loved it! It’s my new go to recipe for non vegans. My sister in law loves cauliflower rice so I can’t wait to make it for her! I’ve made it once without chick peas and twice with and I have to say try it with the chick peas it’s so good! For anyone else out there who doesn’t have cauliflower or doesn’t want to spend $3.00 for a small head of cauliflower – using regular rice will work too. I used 2 cups of cooked brown rice instead of cauliflower. I think it’s actually more delicious with the cauliflower because it takes on more of the parm flavor but it worked in a pinch and was still quite good! One suggestion though is to use less garlic. I think it may be a misprint in the recipe where it says 2.5 tablespoons of minced garlic bc I used that the first time and it was way too garlicky. After looking it up one clove of garlic is 1/2 teaspoon so I think it should say 2.5 teaspoons of minced garlic. I use the stuff from the jar. Unsweetened soy milk instead of almond milk ok? I’d recommend rice for a more neutral flavor. Absolutely fabulous and so comforting! I made it in the morning and it sat on the counter all day then popped in the oven for dinner! This was sooo good!! One of my favorite recipes I’ve ever made! It tasted exactly like cheese!! Thank you!!! Very very good! Perfect for this cold and rainy weekend. I omitted some salt (as per usual) and added some sliced tofu and sriracha for a full meal. I made this tonight for the first time. Overall great, and I will make again. Lovely creamy comfort food with lots of vegetable goodness. I added chickpeas, gave it more bite which I liked. This took me about 30 min to prep, and created lots of dirty dishes, but it was the first time I tried it, I hope to streamline it a bit more next time. Just curious what is other people’s favourite brand of nutritional yeast? I use Marigold yeast flakes but haven’t tried any others. My sauce was more beige looking than in the photos but I’m guessing that varies with yeast types. Also wondering what other veg might work in this instead of broccoli. My son won’t eat broccoli unless it’s completely hidden. Any suggestions? Is this something that is good for left overs or is it better to be eaten the night it is baked? Even better than I expected!!!! The sauce is to die for! I’ve never had a casserole before–should be a GREAT first time recipe! My family loved it, so it’s going back on our meal plan next week. ^it didn’t register the stars .-. Loved this recipe! This is definitely a keeper! Amazing. Totally delicious and satisfying and healthy (all those cruciferous veggies!)! I made this for dinner tonight with the chickpeas added in. It was just as tasty as I would expect a MB recipe to be! My boyfriend also enjoyed it, and he can be a little picky about these type of dishes. I could see this being a hit at a potluck or Thanksgiving. I had to knock this down to 4 stars b/c it involved a lot of steps and different pans and skillets. I was able to skip one of the steps by not returning the sauce to the skillet after blending. It seemed pretty thick in the blender, so I just skipped reheating it. This allowed me to use the same skillet to cook the cauliflower. Also wanted to add that your vegan parmesan recipe is so perfect!! I actually reduce the salt by a lot (only use 1/8 tsp) when I make it but it is still so flavorful. I always keep this on hand in the fridge! Wow. Just wow. I made this tonight for dinner, followed it exactly (adding some kale) and it was AMAZING!!!!! It really tastes like cheese! Incredible. Thank you Dana. I know you must have put a ton of work into this recipe and it’s greatly appreciated. =) I’ll be making this for holiday parties for sure! OMG this is SOOO GOOD! I made it last Thursday so my husband would have something to eat over the weekend while I was away. It is the perfect base for Dana’s vegan parm that I use on literally everything. At first I was a little intimidated because it has so many steps. It took me a little longer but now that I have made it once I could significantly cut the time down. I didn’t have a cheese grater and only had a hand grater with very very small holes. As a result it ended up less like rice but was still delicious in the recipe. I think this recipe would be a great one to have when family comes to visit! Delicious!! I have been a bit wary of using thiiis much nutritional yeast/ vegan parm in one dish, but I finally made it tonight and it was so creamy and comforting! And healthy, too. I didn’t have plain almondmilk on hand, so I subbed 1/2 almond/coconut milk blend and 1/2 vegetable broth to add some more flavor. I also added spinach; next time, I’ll definitely try it with some chickpeas too! Wow, just finished making and eating this dish! I added chickpeas to make it a full meal. Both my husband and toddler devoured it (as well as I). The cons were it took awhile to prepare, and I seemed to use a lot of dishes. The pros were a delicious, healthy meal for my entire family! I would describe it as traditional, comfort food (but it’s healthy!). Thank you so much for this recipe. I will be using it over the holiday season. Made this earlier this week when both my baby and I caught a cold. It has been the most wonderful, comforting meal to eat all week for both of us! Thanks Dana! For anyone who is looking at the comments trying to determine if you’re going to try this recipe, do it! At first look it seems a bit complicated and a lot of dishes to dirty but it is totally worth it. If your skillet if big enough you can skip the bowl and mix everything in the skillet before transferring to the baking dish. Next time I might try making the sauce in a pan deep enough for an immersion blender to save on the full blender cleanup. To save prep time for mid week, I riced my cauliflower and steamed broccoli the night before so it came together really quickly. SO, SO GOOD! thanks for another winner, Dana! I’m out of almond milk, but do have coconut milk (from a carton). Will this work as a sub for the plain almond milk. I really want to make this for dinner tonight!!! I don’t think so! Coconut flavor is too overwhelming. You could try making almond milk at home in a pinch though! Soak in very hot water for 1 hour to save time, and omit adding any sweeteners or vanilla. Good luck! Just made this tonight – DELICIOUS! The only sub I made was whole wheat flour for arrowroot. I’ve already recommended this recipe to a couple friends who will likely enjoy it as much as I did! This is amazing comfort food for a cold night in Ireland!! Any advice on how to make a spicy version? My cooking used to be terrible…I mean really awful! But this website has changed my life!! Your recipes are simple and delicious and I’ve cut most animal products out of my diet, which wasn’t even my intention! I work out a lot but my diet sucked and now I can see some amazing results! I’ve managed to get my whole family eating less meat, even my dad! My Mam has a rare form of arthritis and your recipes have helped her a lot! Sorry for the long post but just wanted to say thanks!! Dana, when I first saw this posted, I admit I was a little hesitant because the photo lacked the glamour of many of your photos. Still, I have yet to have a bad experience with one of your recipes, so I checked the ingredients and saw that I could eat them all and I gave it a go. OMG!!! I get it, I get it. Perfect comfort food! So freakin cheesy! So yum!! Thanks for another winner. Amazing love it! Great fotos great food. Okay, I just made it! I will say I’m surprised how much it actually tastes like cheese. I’ve been a nonbeliever. So, a couple questions. a) What do you grease your pans with (we usually use butter in this house, obviously not vegan)? b) Step 4—the skillet doesn’t have to be oven safe, does it? I doesn’t end up in the over, right? Or, did I totally mis-understand this recipe!? I ended up not using a bowl. I cooked the cauliflower, then added the broccoli and coated with cheese sauce in same skillet. Cooking with a baby strapped to your back and 2-year old trying to “help” made it hard to keep reading the directions, lol. c) I did want something crunchy on top, though. Any gluten-free bread crumb options? PS I’m a salt whore and I didn’t have to add any extra. Great job! I’m obviously not Dana but hope she won’t mind me chiming in. b) Reading through the recipe I got the same Impression you did: no oven-save skillet required as it’s all baked in a separate dish. c) As I don’t live in the US I don’t know specific brands yet I’ve heard Udi’s gluten-free recommended many times and else just crumble up any stale bread you have on hand. Though I also like crumbled up (gluten-free for you obviously :)) crackers or pretzels as a slightly different crunchy topping. Oh and kudos to you for managing to prepare this with two Little ones around! That’s a serious accomplishment. Wow. Easily a 10/10 recipe. I think the addition of potatoes or pasta could make it even heartier (if that’s what’s you desire of course). WHOA. Good idea! Next time! Just made it and once again very impressed! Looks like this will be my go to winter dish! Thank you and keep it up! Made this for dinner on Friday night and, WOW! I’ve never been disappointed by one of your recipes before but I was blown away by this one! It tastes EXACTLY like the broccoli casserole I grew up eating (which is a good thing), but without the mounds of diary. I can’t thank you enough for this! I am so excited to make this on the regular. Even my 15 month-old daughter loved it. Thanks!! Okay…you’ve done it! You’ve convinced me to give these no-cheese cheesy meals a try. And I can’t make a cheesy comfort food without the addition of smoked paprika. :) I think it should go well with this dish. Can’t wait to find out. I do have a question, though: even though I looked at every unsweetened almond milk in the grocer’s, all of them had “vanilla” as an ingredient, even the non-vanilla ones. Even though I am loving the dish, I can taste just the tiniest bit of vanilla. Can you recommend some brands you would use for this dish? You can also try subbing rice milk that’s plain and unsweetened! I just used water and it worked great! Trader Joe’s tends to have their own almond milk (or “almond beverage”) that’s unsweetened! Is it possible to make the sauce with cornstarch instead of arrowroot? I made this but I used basmati rice instead of cauliflower because I have a ton of basmati in the pantry and no cauliflower. Omg this was amazing! I’ve tried several of your recipes and all of the have been insanely awesome! Just wondering how much rice you used?? I saw this recipe this morning and knew that I had to make it. It did not disappoint. It was great. My non-vegan daughter loved it as well. I added a little kale, but nothing else. I did not saute the cauliflower before cooking the dish. It still came out great with one less dirty dish. I baked it for the max times listed in the recipe. I’ve just added this to next week’s dinner menu. ? This looks amazing! Your blog is my go-to for cooking for friends and family, by the way. Quick question – if you freeze this, do you bake it completely, then let cool and freeze? Or do you just go through step 11 and then freeze? Many, many thanks! Hmm, I would actually freeze it unbaked and then thaw slightly before baking! Good luck! Make this at least once a month, and always freeze any leftovers for a second meal! Nutritional yeast is used to give it a “cheesy” flavor so if you’re not vegan, you could probably just substitute shredded cheese. This sounds great! I’m hoping it will be as good if I use homemade garlic infused oil in place of garlic. FYI editing error: In line 3 of ingredients, the olive oil is listed twice. I’m sure you meant to include avocado oil as it appears further down in the recipe. Sorry , couldn’t help but notice. Hi!I love broccoli and cheese, and was wondering if you have any broccoli and cheese soup/cream? I live in South America and it is not a meal that we eat, but I love it and I dont have any recipes. Thank you for your work, it is amazing! I live abroad, do you have a digital form? Yup! You can find digital copies here! Just wanted to tell you how much I love your blog. When I became a primary care giver for my mom I had to start really cooking again. And then we decided to drop the meat and poultry from our diets. So we didn’t die of meal boredom, I managed to find Pinterest and food blogs. While we’re not vegan, thanks to you I can now cook like we are. Your blog is well-written, and the recipes are beautifully simple and so yummy. I follow a few food blogs and yours is one my favorites. And I don’t just skip to the recipes, like I do on other sites (don’t tell!)! Keep up the brilliant work! When I checked your website about an hour ago, I was super disappointed that you didn’t have a new recipe for me….especially going into the weekend. No pressure!!!! We are all into Fall recipes here like you alluded to in the post and I’m dying for some fall comfort food. I really love how you used both broccoli and cauliflower in this one, they are so reasonably priced this time of year. Thanks for using seasonal ingredients. Will be cooking this weekend. Yay. Does the cauliflower rice not get soggy soaking and baking in that cheese sauce?! 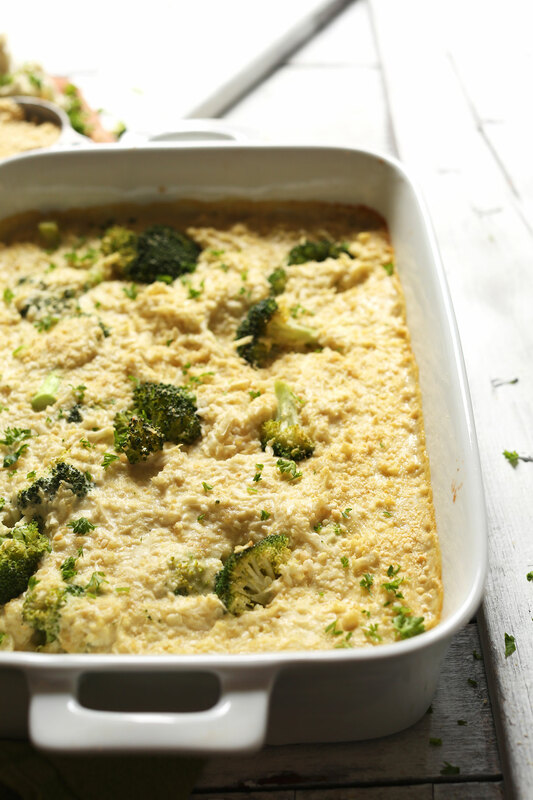 What a cheesy cruciferous (cauliflower, broccoli, kale) culinary concoction! (Impressed with the alliteration? That’s what eating such a satisfying whole foods plant based diet can do for the brain (and your recipes have helped so much in this quest). Just saw that you are in the running on a Disqus poll for best food blog—-the only vegan one! Of course I voted for you. For those who haven’t yet voted, let’s support Dana and help her win (wouldn’t that be amazing if a vegan blog won and if Dana was recognized for her efforts in superb writing, photography, and recipe development? ).